Today we are going to learn how to do a Tunisian purl stitch in Tunisian crochet. 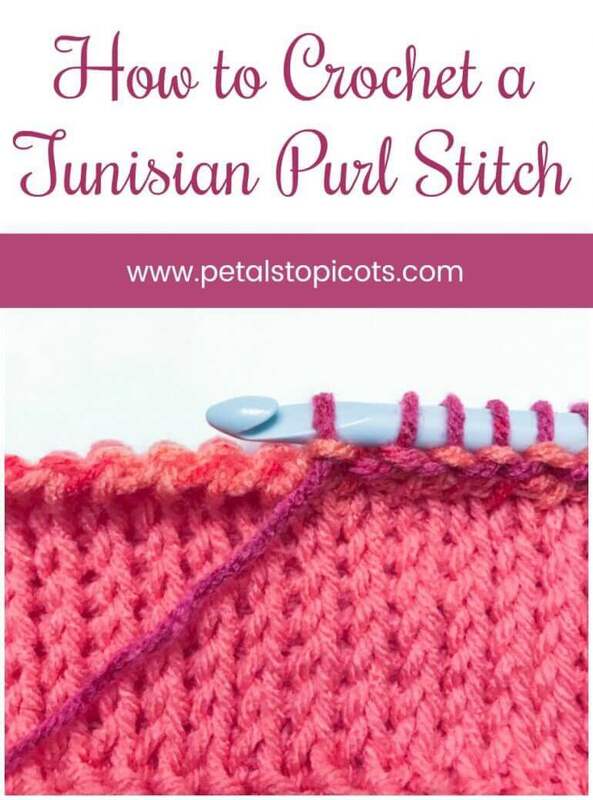 The Tunisian purl stitch (abbreviated as Tps) looks much like a purl stitch in knitting and is great for adding texture to your Tunisian crochet projects. Use it for a garter stitch look, as an edging, or pair it with a Tunisian knit stitch for a ribbed effect. Another little trick I learned with the Tunisian purl stitch is that if you incorporate it into the beginning or ending rows of your project, it really helps combat the curling effect that is notorious in Tunisian crochet. 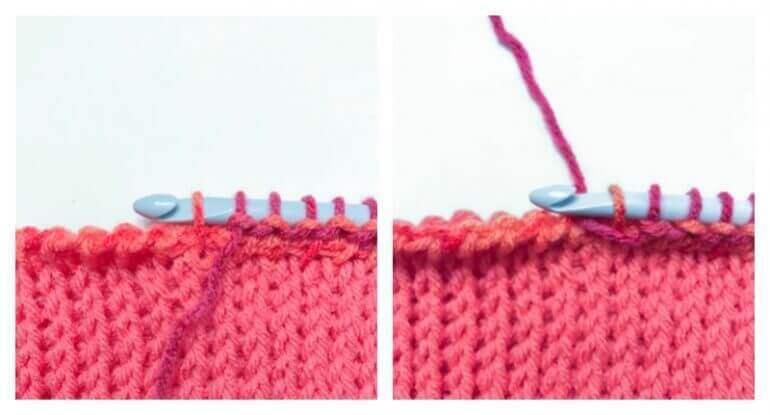 The Tunisian purl stitch is really very simple and I’ve included step by step photos below to (hopefully!) help make it even simpler. Using a Tunisian crochet hook, chain any number of stitches or the number indicated in your pattern. Work a foundation row of a basic forward pass and return pass or add onto an existing swatch of stitches. 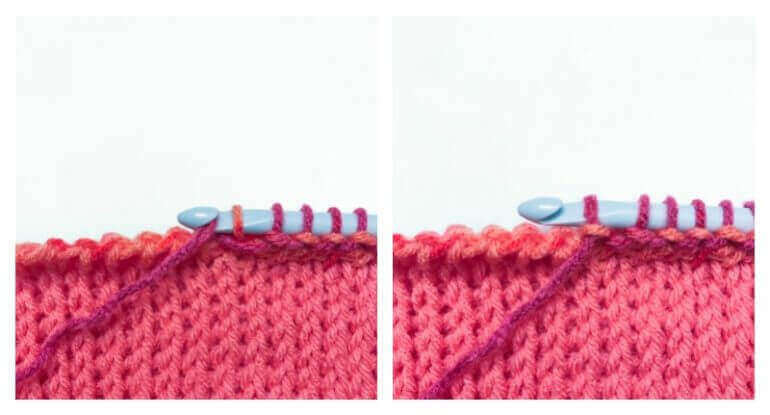 To work a Tunisian purl stitch, bring the working yarn to the front of your work and insert your hook through the next vertical bar. Wrap yarn behind and over the hook. Pull through vertical bar loop on hook. Your first Tunisian purl stitch is complete. Continue these steps across your row or for as many Tunisian purl stitches are indicated on your pattern. Work a basic return pass. Show off your Tunisian crochet projects. Tag me on Instagram @petalstopicots… I love seeing your projects! What a wonderful thing to know. I am always having to use fringe on my Tunisian afghans in order to keep the edges from rolling. Thanks for sharing this tip. I use the Tunisian purl stitch after I do the foundation row and before I start the pattern, and the project does not roll. It does not change the pattern at all, in fact you don’t even notice the tps row.